Murmansk (Russian: Му́рманск)  is a city in the extreme northwest of Russia and the world's largest city north of the Arctic Circle. With a population of over 300,000, Murmansk is the largest city in the Arctic and an important Russian naval base and commercial port. During World War II (known in Russia as the Great Patriotic War), Murmansk served as a port for the arctic convoys, and after the war became the Soviet Union's most important submarine base. Murmansk Airport  (IATA: MMK) has multiple daily flights to Moscow and Saint Petersburg, and limited services to other Russian cities including Arkhangelsk, Sochi and Rostov-on-the-Don. Seasonal flights are avalible from Helsinki. The airport is located about 40km south of Murmansk, near the town of Murmashi. Taxis to the city center cost about R700 and make the trip in about 40 minutes. Catching a taxi waiting outside the airport is more expensive, expect to pay up to R800. For cheaper (and official) taxiservice, you have to order a taxi, expect to wait up to 30-40 minutes for it to arrive, though. Bus 106 goes to the train station, stopping at Detsky Mir near the Poliarnie Zori Hotel on it's way, is less expensive but much more sluggish than a taxi. During the summer months, Murmansk Shipping Company  offers occasional trips to and from Barentsburg on Svalbard. They also serve remote villages along the northen coast of the Kola peninsula, most notably the isolated naval base of Ostrovnoy, with 2-3 trips per month. 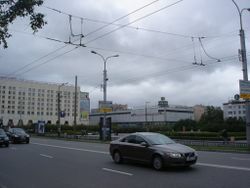 Murmansk can be reached from most places in north-west Russia by train. Moscow is 35-40 hours away and Saint Petersburg 27-30 hours, depending on the train. The Arktika (Арктика) branded train is the fastest option, it also offers first-class wagons and a restaurant onboard. All trains make stop-overs in cities such as Kandalaksha and Petrozavodsk on their way. Other night trains reach Murmansk from cities as far east as Arkhangelsk or from Minsk and Brest in the west. There is also a local night train from Nikel close to the Norwegian border. Trains from Saint Petersburg and Moscow are daily, most others 2-3 times a week. During summer additional routes are added, mostly to Ukraine and the Black Sea. The central train is located in the city center, one block downhill from Five Corners Square on ul. Kominterna, 16. You will probably get a quick FSB control once you arrıve at the traın statıon. Routıne stuff, no worrıes. There are bus connections from Finland (Ivalo, with connecting bus from Rovaniemi) and Kirkenes in Norway. Keep in mind that departure times of Russian bus companies from Kirkenes usually are given in Moscow time. 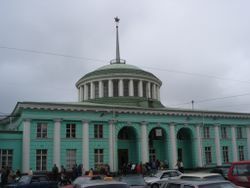 Although Murmansk is long and thin, most sites of interest to visitors are within a fairly compact area in the city center. Prospekt Lenina is the main north-south thoroughfare through the city center and the central Five Corners Square. Avid walkers could cover the entire stretch of the central area from the Poliarnie Zori Hotel on the south end of the city center to the Alyosha Statue, which is situated on a plateau on the north side of the city in less than two hours. Trolleybuses are available on most larger streets and generally follows a north-south route, if you are heading east ("up the hill") you have to rely on the small marshrootka buses. Notice that both buses and trolleybuses can be much-delayed during rush hour due to traffic jams. A new route planner, which also shows realtime locations of trolleybuses on the most used lines, is available online , the catch is it's in Russian only. Another option is to use taxis, which are plentiful and cheap, few drivers speak anything other then Russian so memorize the street or name of the place you are going to. A typical journey in the city centre will cost somewhere around 300 RUB. Unmarked taxis can be cheaper but are generally a bit unreliable to use for those not fluent in the native tongue. The most convenient way to get around is to order a personal English-speaking guide with a car. It is also not expensive. Usually the price is about 1000 RUB per hour. As a relatively new entity, Murmansk has few real sights apart from the giant statue Alyosha; architecture buffs will, however, be intrigued by the crumbling but Stalinist architecture downtown. Walking up into the nearby hills offers remarkable views over the city, Kola bay and the surrounding completely barren mountains - revealing how far north the city really is. The city offers several museums, all mildly interesting for a visitor but gives a good appreciation for the region's history and art. моисей (24-hour cafe with wireless internet), Kominterna ulitsa 9/1 (Downstairs in shopping complex across from train station.), . There doesn't seem to be a lot of wireless internet hotspots so моисей is a good option. Cheap draft beer and (uninviting) food, this is not a bad place to get one's bearings and check emails after arriving in the city. Some wild parties occur in/around abandoned factories during the white nights or summer week-ends. Get in touch with the locals for this. The wilderness of the Kola peninsula and Murmansk Oblast is perfect for camping, fishing or hunting. A great deal of travellers continue out into the wild from here. There are several large national parks nearby and there are several companies to organize your trip. 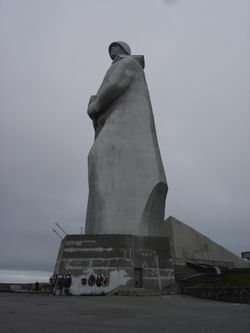 Or you can head north; Murmansk is a great place to start your icebreaker cruise  to the Arctic Sea and the North Pole. Rent a car (French Renault Logan for about 25 euros for 24 hours) and drive north to the Barents Sea (2 hours). This page was last edited on 5 August 2018, at 12:23.